Nuclear Medicine deals with diagnostic imaging of various diseases as well as pathological changes by using isotopes and radioactive radiation. Nuclear medicine uses the biophysical conditions of the living cell in order to controllably destroy cancerous tumors without endangering healthy tissues. The use of radioactive materials is designated for testing the function of vital tissues like brain, glands, and blood vessels and is injected intravenously. A special screening camera, sensitive to gamma rays, identifies and records radioactive emission from the body. The Institute of Nuclear Medicine at the Kaplan Medical Center offers a wide variety of imaging by using modern equipment and advanced medical inspections in the areas of oncology, neurology, cardiology, endocrinology, surgery, orthopedics, and pediatrics. The Institute's services are supplied to all departments and clinics at the Kaplan Medical Center and the Harzfeld Hospital as well as to various community clinics. The Institute operates on a daily basis and executes approximately 7,500 medical inspections per year. The number increases every year. The Institute is currently situated in a basement with bad ventilation conditions which are not the standards required for a nuclear medicine institute. In addition, patients visiting the various outpatient clinics of the hospital pass through the institute in order to get to the various clinics, which affects our functioning due to the traffic. This situation requires transferring the institute to a more suitable place. The new Institute is planned to be transferred to the Hospitalization Building B on the 1st floor, where some other institutes are located, like the Center for Breast Health, Women Ultrasound Unit, and the Genetic Institute (which is planned to be added). The current space today is 550 square meters. The plan is to enlarge it to 750 square meters in order to facilitate its function as the Isotopes Institute. 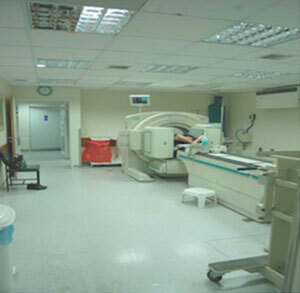 The Isotope Institute is equipped with a Philips Gamma triple-headed camera, a Siemens dual-headed camera, and a Philips Gamma camera specialized to help diagnose cardiac diseases. These most advanced instruments enables performing medical inspections at the highest level, but in order to improve the ability of precisely placing the active pathological finding that are seen by the imaging, the purchase of an isotope camera, SPECT-CT is required. This is a combined Computed Tomography (CT) camera and costs approximately $600,000. Purchasing such a camera will enable the perfect functioning inspection with an anatomical inspection.